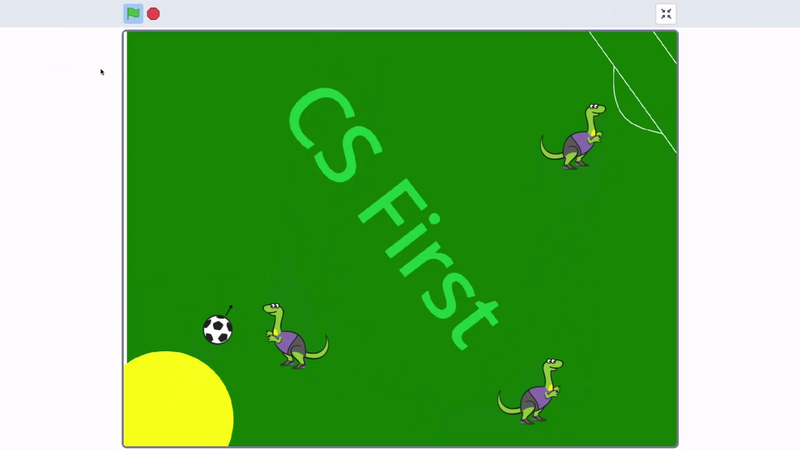 In this Google CS First sports activity you will build an all-star passing drill while you learn about the computer science concept called sensing. Sensing in computer science is when the computer takes in information then uses it to make decisions. This is just like what you do in real life. People find out about the world by collecting information through there senses. Then they react and make decisions based on that information. When you feel a hot stove you pull your hand away. If you hear the music of an ice cream truck you run towards it. Computers and robots also sense things in the world around them and react to what they detect. Each year, students and researchers gather at an even called RoboCup to play soccer with robots. To play soccer, the robots have to sense the locations of their teammates, the ball, and the goal, and then react accordingly. Check out this video that shows a member of one of the RoboCup teams, the SpelBots, demonstrating how their robot finds and moves towards a ball. So the robot is tracking the ball and walking towards it. As you can see its head moves when the ball moves to be able to track it. And it moves backwards so that it can be in its range of vision, and then it moves forwards when it gets to a certain point to know to walk towards the ball. And this is very helpful in our RoboCup competition because, as we've said, the goal of the competition is to play soccer, and essentially, we would like to beat the world champions by 2050, so that's basically the research portion of us studying and trying to see what we can do to better enhance the robots to play soccer as best as possible. In 2009, the SpelBots tied for first place in the RoboCup Humanoid Soccer Championship. What researchers learn in RoboCup helps them to build other machines that better sense the world around them. The vehicle should be able to navigate the track autonomously, so a robotic driver at work, and then it comes to a stop. The same computer science concepts practiced in RoboCup are also used in the self-driving car. RoboCup robots need to sense the ball, goal posts, and react to the other players. The self-driving car senses and reacts to the road, stoplights, and pedestrians. In the future, self-driving cars may help blind people get around and reduce the risk of automobile fatalities. The sensing ability computer scientists like you will give them will help improve and save lives. You lose your timing in life. Everything takes you much longer. There are some places that you cannot go. There are some things that you really cannot do. Where this would change my life is to give me the independence and the flexibility to go the places I both want to go and need to go when I need to do those things. In this activity, you'll program a project to sense when buttons on the keyboard are pressed, when sprites touch each other, and when the sprites touch the edge of the screen. The starter project gives you a passer, receiver, and a ball or puck. Click on the starter project link for the sport of your choice, and sign in to Scratch.